Filta, best known as the company that invented Mobile Fryer Management, has just been named a preferred national vendor for Centerplate. Centerplate has been making it better to be at gathering places across North America and the United Kingdom since 1929. Centerplate and their partner venues have been defining extraordinary experiences through thoughtful hospitality, expertly delivered, for more than 80 years. Centerplate’s strategic approach to hospitality creates tailored food and beverage programs, unique hospitality design, rewarding event and retail services to deliver the type of one-of-a-kind, local authenticity that builds loyalty, reputation, and memories. They have the distinct privilege to partner with over 300 premier event venues across the United States, Canada, and the United Kingdom; annually serving more than 115 million guests. Established in the United Kingdom in 1996 and brought to the USA in 2002, Filta is the world’s leader in commercial fryer, cooking oil management, and walk-in cooler management services; and offers its services through a worldwide franchise network. Filta is dedicated to saving its client’s money, creating a safer working environment, and providing customers with the tools to increase the quality of their product, all while preserving the environment. Filta services over 5,000 customers every week and has recycled over 1/2 of a billion pounds of oil and counting! 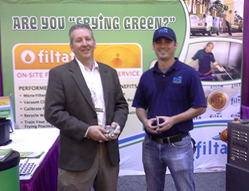 For a free site analysis visit the Filta website at http://www.filta.com or contact Filta at 1-866-51-Filta.